This latest addition to The New Press’s People’s History series offers an incisive account of the war America lost, from the perspective of those who opposed it on both sides of the battlefront as well as on the homefront. 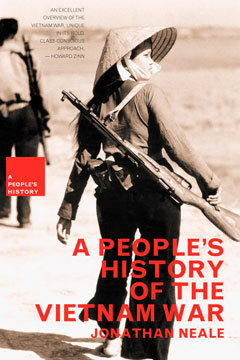 The protagonists in Neale’s history of the “American War” (as the Vietnamese refer to it) are common people struggling to shape the outcome of events unfolding on an international stage—American foot soldiers who increasingly opposed American military policy on the ground in Vietnam, local Vietnamese activists and guerrillas fighting to build a just society, and the American civilians who mobilized to bring the war to a halt. His narrative includes vivid, first-person commentary from the ordinary men and women whose collective actions resulted in the defeat of the world’s most powerful military machine. Jonathan Neale has written many plays, novels, and works of nonfiction. His most recent books are Tigers of the Snow, Lost at Sea, and A People’s History of the Vietnam War. He lives in London.